+ one = 2 Required Please enter the correct value. The Etsy Inc. (Nasdaq: ETSY) stock price is down 4.3% in afternoon trading today (Tuesday). ETSY stock has now fallen 27% since Aug. 1 and currently trades at $15.22 a share. One reason why the Etsy stock price is down is volatility in the broader U.S. market. As of 2:25 p.m., the Dow Jones Industrial Average and Nasdaq Composite were down 1.5% and 2.1%, respectively. But shares of the handmade goods marketplace are also being crushed today by one of its biggest competitors – Amazon.com Inc. (Nasdaq: AMZN). Back in May, Amazon announced it was developing its own online marketplace for artisan goods. The company is calling it "Handmade" and quietly launched a beta version allowing users to apply to sell their products on the soon-to-be-finished platform. While no official launch date has been announced, it's clear that Amazon Handmade could be an "Etsy killer." Amazon's 278 million active accounts dwarf Etsy's 21 million users. 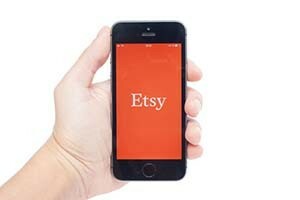 That means the Etsy stock price could fall much lower if Amazon Handmade finds early success. Since its April 16 debut, Etsy has been considered one of the worst IPOs of 2015. The Etsy stock price has plunged 49.3% from its first-day close of $30 a share. The first reason Etsy is a bad investment is the company's lack of profitability. Etsy's operating expenses have skyrocketed in the last couple years. They increased 81.4% in 2013 and 67.6% in 2014. Although the company is slowly reducing costs, the operating expenses of $43.2 million in the second quarter alone show the company is still a long way from turning a profit.